This colorful pasta dish really does taste like a slice of pizza with everything on it! 1. Cook pasta according to directions on package. Drain and rinse in cold water until cool. Drain well, then place in a large serving bowl. 2. While pasta cooks, saute the onion and bell pepper in 1 tablespoon olive oil until crisp tender. 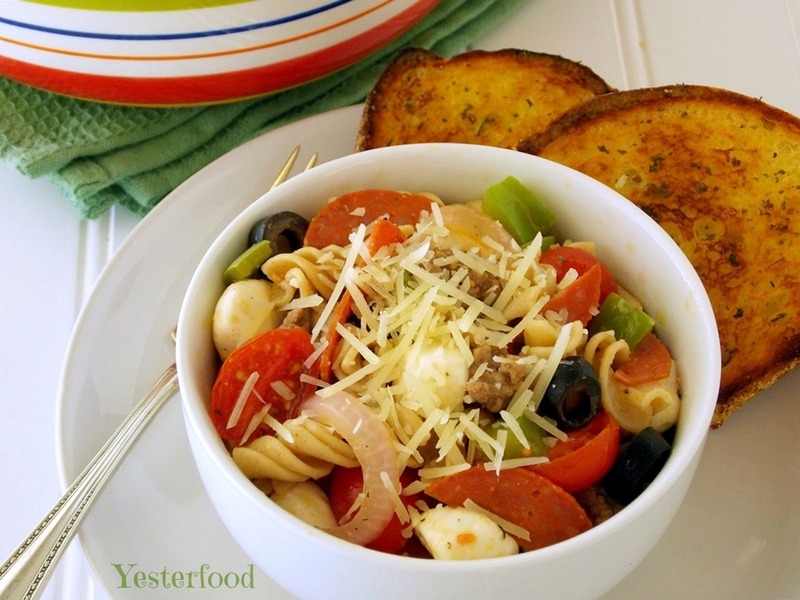 Toss into pasta, then add tomatoes, bocconcini, sausage, pepperoni, and olives. 3. In a medium bowl, whisk together all the dressing ingredients until well-combined. Pour over pasta mixture and mix well. Sprinkle with parmesan cheese. Serve at room temperature or cold. Refrigerate leftovers. We preferred the pasta at room temperature. The next day, we warmed individual servings slightly in the microwave. Shared at these great parties! I think kids would like it...pizza flavors and all! :) Thank you for coming by, Jamie, and thanks for pinning! I need to make this soon!! Love!! This looks great. I pinned it. I'm stopping by from the Super Sunday Link Party @ Who Needs a Cape! Michaela, thank you, and thanks for joining us for Let's Get Social Sunday! I enjoyed my visit to your blog- you write about such a great variety of subjects! I am stopping by from Sweet Tea Social to have that bowl of Supreme Pizza Pasta, it looks fantastic. Hope you are having a great day and thanks for sharing this delicious recipe. Hi, so glad you came over from the social! :) Yes, melted cheese on top of almost anything is a good idea (to me, anyway)! ;) If you'll let me know which blog is yours, I'd love to repay the visit! This is such a fun kid-friendly dish, Joy. Thank you for sharing w/ See Ya in the Gumbo this week. Yummy, this looks tasty and fun! Stopping by from Manic Monday! oh YUM does that look good!!! 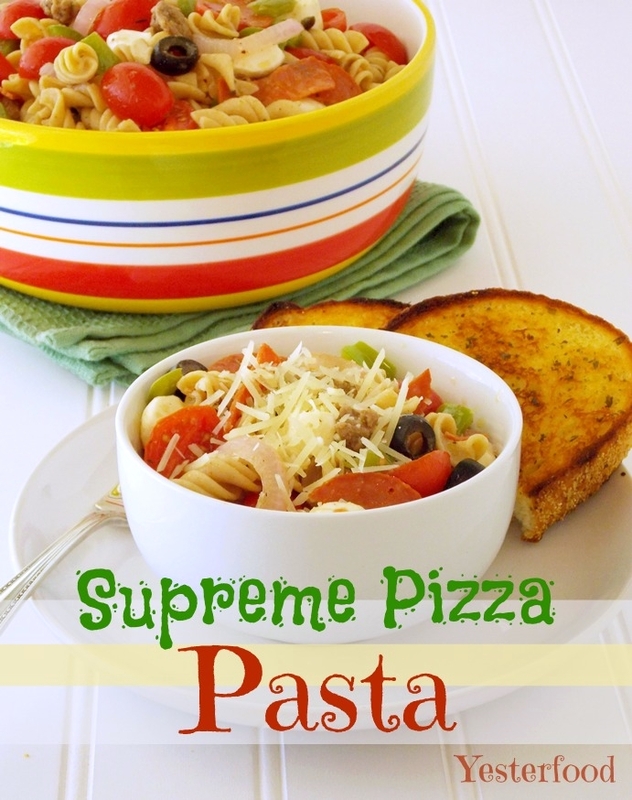 Pizza and pasta combined -- you can't go wrong! 2 of my favorite foods! Thanks for sharing. My family loves pizza and pasta, so this is a natural. Why didn't I think of that! Thanks for sharing at the In and Out of the Kitchen Link Party! Yummy, this looks delicious! I'm a sucker for anything that has to do with pizza! Yum. Great pasta dish! Pinning this and sharing on FB and Twitter. Thanks for sharing at Marvelous Mondays! This looks so delicious! Pasta salad is such a classic and I love seeing all the twists people make on it. Yours sounds like it would taste fabulous! Hi Joy, this recipe looks so good and something that my family would love for dinner. I pinned it and will save to make for the future. I saw it on What's Cooking Wed. Anything with bocconcini in it, has my vote. This looks fabulous Joy! Thanks for sharing at Simple Supper Tuesday. Thanks, Sara! Kids do seem to like it. I think it would go really well with your yummy Low-Fat Frozen Peach Yogurt! ;) Thanks for visiting! Hi Joy, this recipe looks so good and I can't wait to try it. I saw it on mostly food and crafts link party. Happy Labor Day. Joy, stopping in from What I'm Eating. This is a great idea, I'm a vegetarian and this would taste great removing the meat. Thanks for sharing it. I have to tell you I usually hate pasta salads but this looks like a winner for me! I try so hard to eat pasta salads to change things up, making it seem like a pizza would probably help me eat it so much easier. Thanks for sharing! This will definitely be a Friday Night meal - thanks for sharing! This sounds delish! Thanks for linking to Saturday Dishes. Drop by today. We're talking eggs. Yes, this will definitely be on the menu this week! Delicious! Thanks for sharing it at the what i am eating link up! Adelina, thank you so much- we really liked it! :) I always enjoy Foodie Friday! Great picture! This sounds delicious! Thanks for sharing at Sweet & Savory Saturdays #28. My grandma used to make something reminiscent of this only she called hers "goulash" (it was nothing like recipes for real goulash). I think your recipe has a lot more pizzazz! Ooo, I'd love to see her recipe sometime! Hey, I should have called this recipe something about "pizzazz"...Supreme Pizza Pizzazz! :) Thank you for coming by! Thanks for partying with us last week. We loved your recipe! I don't cook much but you made me want to go to the grocery. Please come back on Friday. Craft Frenzy Friday http://obsessiveandcreative.blogspot.com. This is an amazing recipe and It is featured in this weeks friday food frezny. hope to see you there again this week. Pizza and pasta two of my favorite things... Just wish that hubby would like them as much as me. Coming over from Swap N Share Sunday. G'day Joy! YUM! I could so go for some of this right now!